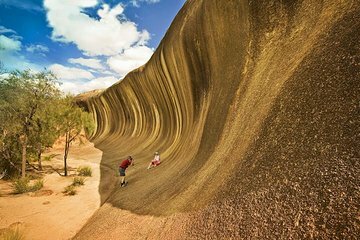 Visit gravity-defying Wave Rock during this full-day, guided, multi-stop sightseeing tour that includes lunch. Walk along the Avon River near the town of York and cross a swinging bridge and learn about the importance of dogs to farm life in Corrigan. Stand under the undulating Wave Rock, a formation believed to be billions of years old frozen in the shape of a cresting wave. Snap photos at Hippo’s Yawn Cave.